ESA (Emotional Support Animals) Therapy pets & Service animals. What are the differences? There are differences between the 3 most common support animals categories. People that are uneducated in this particular area often use an inappropriate name for the type pr pet they have. This will help you learn the differences between the different names and also what categories pet pigs can fall under. Therapy animals, like those who participate in the Pet Partners Therapy Animal Program, provide affection and comfort to various members of the public, typically in facility settings such as hospitals, retirement homes, and schools. These pets have a special aptitude for interacting with members of the public and enjoy doing so. Therapy animal owners volunteer their time to visit with their animal in the community. These animals must pass a difficult test with an assessor in order to be certified as a therapy pet. Pigs can participate in therapy pet services offered wherever, but again, this is a difficult test and usually takes a significant amount of training before a pig is ready to be tested out. There are several types of therapy pets, but pigs CAN be certified as a therapy pet. A therapy animal has no special rights of access, except in those facilities where they are welcomed. They may not enter businesses with “no pets” policies or accompany their handler in the cabin of an airplane regardless of their therapy animal designation. They can not live in housing that prohibits pets or a county with limitations regarding the type/breed of pet allowed within the jurisdictional limits. Service animals are defined by the Americans with Disabilities Act (ADA) as dogs and in some cases miniature horses that are individually trained to do work or perform tasks for people with disabilities. These are the ONLY animals approved to serve as "service" animals. Examples of such work include guiding people who are blind and alerting people who are deaf. Service animals also employ specific skills to provide mobility assistance, communicate seizure alerts and/or perform other duties that mitigate an individual’s disability. An emotional support animal, sometimes also referred to as a comfort animal, is a pet that provides therapeutic support to a person with a mental illness. To be designated as an emotional support animal, the pet must be prescribed by a licensed mental health professional for a person with a mental illness. The prescription must state that the individual has an impairment that substantially limits one or more major life activities, and that the presence of the animal is necessary for the individual’s mental health. Per the ADA, individuals with emotional support animals do not have the same rights to public access as individuals with a service dog. Emotional support animals may only accompany their owners in public areas with the express permission of each individual venue and/or facility management. Emotional support animals may travel with their owner on an airplane and may live with their owner in locations covered by the Fair Housing Amendments Act (FHAA) regardless of a “no pets” policy. Although most frequently dogs, other species may be prescribed as emotional support animals, such as pigs. Please don't register your ESA pet, EVERY SINGLE registration is a scam and by flashing a card you're given to register your pet as an ESA animal, you're actually making it harder for others who haven't paid for a fake registration because when being questioned, the owners are asked for proof and to be honest, the proof is your doctors prescription, not some card you get in the mail. Under US law an Emotional Support Animal (ESA) is a pet which provides therapeutic benefit to its owner through companionship and affection. Emotional Support Animals are not required to have any specialized training or registration, they require only as much training as an ordinary pet requires in order to live peacefully among humans without being a nuisance or a danger to others. The Fair Housing Amendments Act of 1988 (42 USC 3601, et seq.) allows you to live/stay anywhere you like without pet fees. Any home, any lodging – even ones that specifically prohibit Dogs. Any well behaved pet can be an Emotional Support Animal with appropriate documentation from a licensed physician. That is ALL that is needed. Are Emotional Support Animals (ESAs) the same as Service Dogs (SDs)? No, Emotional Support Animals (ESAs) are not the same as Service Dogs (SDs). ESAs are Therapeutic Pets, usually prescribed by a therapist, psychiatrist or doctor, that help the mentally disabled with emotional difficulties or with loneliness. They may include cats and birds or other pets besides dogs that are able to fulfill the emotional support needed. Under the US Federal Laws, Emotional Support Animals (ESAs) cannot go into no-pets-allowed places, BUT THEY ARE ALLOWED to live in “no-pet” housing and can accompany owners in the cabins of airplanes when accompanied by a note from their handler’s doctor. This does NOT trump the city's zoning ordinance, this allows a pet to live in an area where there is a "No Pet" policy, but if your city/county/town doesn't allow pigs, this does NOT give you permission to have a pig. Although not trained to do work or tasks, ESAs can be greatly beneficial to their owners just by their comforting presence, company, companionship and love. Can an ESA go in public areas, restaurants, stores, etc? Usually NO. These animals can go where other pets are allowed to go. Most restaurants and businesses are off-limits to pets, so are also off-limits to ESA’s. Some hotels like, Motel 6 and La Quinta are pet friendly. The only special rights that the ESA handler has is that it can LIVE in “no-pet” housing and travel in the cabin of an aircraft. Other than theses two extra "rights", it is just a common pet. Click here to read about Megan Peabody's pig Hamlet who is a frequent flyer as her ESA pet. Isn’t an ESA a Service Dog, and protected under the ADA, so it can go anywere a service dog can go? NO. An ESA has no rights under the ADA and does NOT have public access rights in “no-pets” areas. A pig can NOT be a service animal. 2010 The ADA now defines a service animal as: Service animal means any dog that is individually trained to do work or perform tasks for the benefit of an individual with a disability, including a physical, sensory, psychiatric, intellectual, or other mental disability. Other species of animals, whether wild or domestic, trained or untrained, are not service animals for the purposes of this definition.The work or tasks performed by a service animal must be directly related to the handler´s disability. Examples of work or tasks include, but are not limited to, assisting individuals who are blind or have low vision with navigation and other tasks, alerting individuals who are deaf or hard of hearing to the presence of people or sounds, providing non-violent protection or rescue work, pulling a wheelchair, assisting an individual during a seizure, alerting individuals to the presence of allergens, retrieving items such as medicine or the telephone, providing physical support and assistance with balance and stability to individuals with mobility disabilities, and helping persons with psychiatric and neurological disabilities by preventing or interrupting impulsive or destructive behaviors. The crime deterrent effects of an animal´s presence and the provision of emotional support, well-being, comfort, or companionship do not constitute work or tasks for the purposes of this definition. Service Dogs may have thousands of hours of documented training, ESA’s however, have little, if any, training and behave much like other pets in public. It is a crime, felony/fraud, to claim your pet, or ESA, as a Service Dog with ADA rights. A Psychiatric Service Dog is a dog that helps its handler, who has a mental (psychiatric) disability. Examples of mental disabilities that may sometimes qualify a person for a Service Dog include, but are not limited to: Major Depressive Disorder, Bipolar Disorder, Post Traumatic Stress Disorder, Autism, Anxiety Disorder, and Schizophrenia. * as well as many other tasks directly related to the specific handler’s disability. A Psychiatric Service Dogs (PSDs) may be of any size and of any breed suited for public work. Many are owner-trained (trained by the person who will become the dog’s handler, with or without the help of a professional trainer), but, increasingly, service dog training programs are recognizing the need for dogs to help individuals with psychiatric disabilities. Some Psychiatric Service Dog handlers may choose to refer to their dogs as Alert or Medical Response Dogs, depending on what the dog does for them. In the USA, handlers of PSDs are entitled to the same rights and protections afforded to handlers of other types of service dogs, such as Guide Dogs, Hearing Dogs, and Mobility Dogs, under federal laws. Like all other types of Service Dogs (SDs), Psychiatric Service Dogs are individually trained to do work or perform tasks for the benefit of the disabled person. They have also been trained to act discretely in public places, such as laying quietly under the table in a restaurant, keeping tightly to the handler’s side and not sniffing anything on the shelves of grocery stores, and ignoring other people and animals. Are Therapy Dogs (TDs) the same as Emotional Support Animals (ESAs) or ADA Service Dogs (SDs)? A therapy dog (or therapy animal) is an individual’s pet which has been trained, tested, certified and insured to work in hospital, nursing home, school, and other institutional settings. The therapy dog and their handler visit to cheer patients, to educate the community, to counter grief and stress, and generally be good canine ambassadors within the community. Many therapy dog partners are volunteers. Therapy dogs are not service dogs. Under U.S. law, persons with therapy dogs are NOT granted the right to enter businesses with their dogs which do not permit pets. They do not get to fly in the cabins of aircraft because they are therapy dogs, nor do they get to live in “no pets” housing because they are therapy dogs. This family thought they were ok with having their pig within city limits, especially because their son has a medical condition and his pet pig actually helps him to cope. Now they are having to battle the city. Unfortunately, a pig can NOT be considered a service animal at this time. **Update on the story above. Maggie got to stay home thankfully. For landlords and others who may still be confused about ESA’s and Therapy dogs. Emotional Support Animals (ESA) and Therapy Dogs (TD)/therapy pets are different, be sure you use the proper title. Many confuse the two, they are two different animals, two different purposes and different laws that apply to them. Neither of them are ADA Service Dogs (SD). The therapy pet is a working animal, owned by a NON-DISABLED person. When working, it VISITS hospitals, schools and nursing homes to brighten the spirits of the people it visits. The therapy pet has no ADA RIGHTS and the FHA rules do not apply. An ESA (Emotional Support Animal) is a therapeutic pet, but has special rights under the FHA to allow them to live in “no pet” housing, and rights under the Air Carriers Act so that it can go in the cabin of an aircraft. But this does not apply when your city or county to town do NOT allow particular species of pets to live within city limits. You may be able to file for a waiver for the ordinance, but this will need to be done prior to a pig coming to your home with all approvals already in place. As it is a PET you will have to stay in a pet friendly hotel. It however, does not have any ADA protections like Title I (Work place), Title II (Transport) or Title III (Public Access in businesses). So, your ESA can not go to work with you (unless invited) or go shopping in Walmart or other businesses that ban pets. The requirement to have an ESA are: Be legally disabled under the FHA or State law and/or a letter from your doctor prescribing an ESA for your metal well being. There are NO registrations required through a 3rd party vendor. You are wasting your money and because so many are fooled into believing they must be "registered", they're actually making it more difficult for the people who are following the ESA rules because of uneducated persons asking to see the registration and when they can't produce one, the person requesting it is under the assumption one is needed and denying the ESA animal rights. Please do NOT register your pet used for this purpose. If you are disabled and have a pet that assists you in the home, do not call it a ‘therapy dog’ or therapy pet. Examples of fake registries that are claiming you can use their identification as proof, BUT in this first one, that you're also required to have a doctors letter or prescription. http://www.esaregistration.org/faq/. Paying for this is simply buying yourself an ID card that carries no merit whatsoever and it's a waste of money. If you choose to buy an identification vest or patch or sticker, that's up to you, but NONE of the registries are legitimate. This is a screenshot from a FAKE registry site. You do NOT need to pay money to register an emotional support animal. Other fake registries include- https://www.registermyserviceanimal.com,http://www.esaregistration.org, http://www.nsarco.com/emotional-support-animal-registration-kit.html, https://www.cptas.com/animals.html, http://www.serviceanimalregistryofcalifornia.com, http://emotionalsupportpet.com as well as any others selling a registration in any form. You DO NOT need one! So to answer any lingering questions regarding whether or not ESA status protects your pig from a city or county ordinance? I'm sorry to inform you, but the Federal government does not recognize a certified emotional support animal of any species as a service animal, Therefore, no (ESA) or their handler is protected by the ADA. Revisions and amendments to the ADA formalized last year are very clear in regards to ESA's. A certified psychological assistance animal is defined as: an animal specifically trained to preform tasks for a disabled handler in public that that person cannot perform on their own. These animals and their handlers are protected by the ADA. Only dogs and are recognized as protected species. Specifically noted as non-eligible are cats, mini horses, and barnyard animals. This, unfortunately, places the pig in any variant as livestock or at best pet status. No, it does not give you any protection or rights to house a pig in an area that doesn't have an ordinance allowing you to have a pig or a city/county specifically stating pigs aren't allowed. You may be granted rights for your pig to live in "no pet" housing, but not in a city/county or town that has existing rules against housing pigs within their jurisdictional limits. Pigs can NOT be service animals. Pigs can be emotional support animals and sometimes therapy pets. Service animals are individually trained to do work or perform tasks for an individual with a disability. The task(s) performed by the dog must be directly related to the person's disability. Currently only dogs and miniature horses can be service animals. Here are the FAQ that the Americans With Disabilities Act (otherwise known as ADA) created to answer any lingering questions regarding the differences and clarified longstanding questions people had. Do NOT call your pig a service animal, this is illegal and impossible because pigs can NOT be service pets. Emotional support animals (also known as ESA) do NOT need a registration or certification or special training. This is an animal you choose to provide comfort, mood enhancement or company (amongst other mental health disabilities) for those who have a letter from a licensed mental health provider stating the need for such an animal. This pet has limited rights, but no rights to go into areas where pets aren't allowed. Your ESA pig can travel in the cabin during a flight, as long as the pig is trained and not disruptive. This does NOT grant permission for a pig to live in an area that bans pigs within city limits, etc, but DOES allow the pet to live in a "no pet" area. This is typically seen in apartments or rental properties. ESA animal at the workplace? This will give you some direction on how to go about starting your training so your pet can be utilized to help others. It is a lot of work, but well with it in the long run. 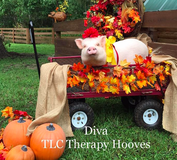 TLC's Therapy Hooves is an organization who uses pigs as therapy animals. Check out their Facebook page by clicking here. ​Click on the following link to see how they worked with this pig to have her tested out. 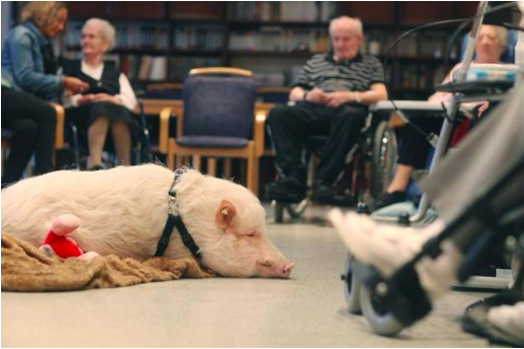 ​Recently, pigs were featured in an NBC story when used at nursing facilities to help with Alzheimer's patients.